Michelle Tucci has had a regular message for her children through the years. In the case of her son transitional Deacon Matthew Tucci, he wasn’t able to get into this life without it. He was born on April 6, 1987, at 26 weeks gestation, weighing only 2 pounds, 4 ounces. Michelle had been suffering from a rare disorder during her pregnancy and was experiencing such regular bleeding that she was constantly anxious about the life of her unborn child. After an emergency cesarean section delivery, Deacon Tucci remained hospitalized for nearly three months as he suffered respiratory and cardiac arrests. “The first few days, it was like, if everything goes well the first 24 hours, then there’s a chance for 48 hours, then 72 hours,” Michelle recalled. The Tuccis now believe that their son’s vocation to the priesthood was at the heart of the reason he survived the difficult circumstances of his birth. Deacon Tucci and five other transitional deacons are scheduled to be ordained priests for the Church in central and southern Indiana on June 25 at SS. Peter and Paul Cathedral in Indianapolis. Mike and Michelle Tucci moved several times while raising their family. No matter where they lived, though, they were active in their parish and passed on their faith to their children. That made an impression on Deacon Tucci. Father Daniel Atkins, pastor of Holy Family Parish in New Albany, was the Tucci family’s pastor about 20 years ago when they moved to Bloomington and joined the St. Paul Catholic Center there. As Deacon Tucci grew from childhood into his teenage years, Father Atkins began to think that the youth might have a vocation to the priesthood. When Deacon Tucci went to college at Purdue University in West Lafayette, Ind., his faithfulness was put to the test. That missing part was not only his faith, but the forgiveness of God he received in the sacrament of penance. “After I made my first confession after a few years, I kind of realized the length our Lord goes through to show us his love and his mercy,” Deacon Tucci said. He soon became active in the St. Thomas Aquinas Catholic Center at Purdue. In the fall of 2008, Deacon Tucci went on a retreat sponsored by the center that ended up being a turning point for him. 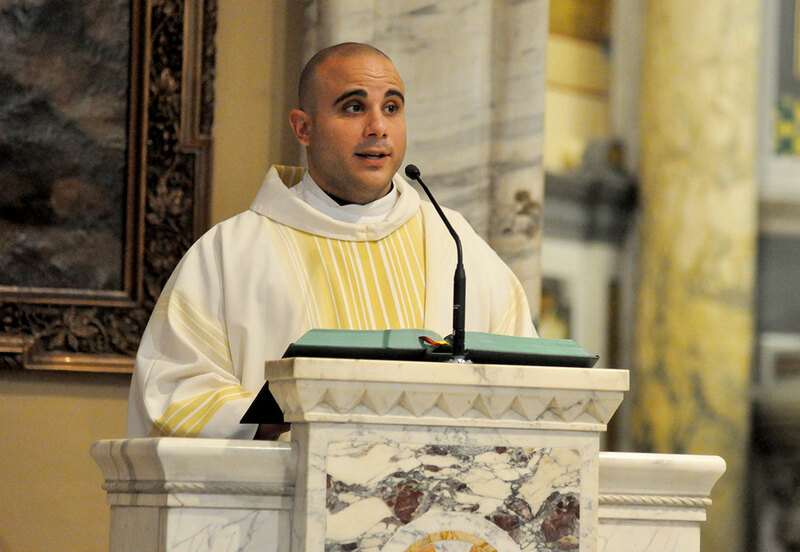 After graduating from Purdue in the fall of 2009 with a bachelor’s degree in advertising and public relations, Deacon Tucci became an archdiocesan seminarian and lived for a semester at Bishop Simon Bruté College Seminary in Indianapolis while ministering nearby at St. Anthony Parish and the former Holy Trinity Parish. Father John McCaslin, the pastor of both parishes, was impressed by this fledgling seminarian who had little knowledge of Spanish, yet was fearless in reaching out to the Hispanic community on the near west side of Indianapolis. Deacon Tucci went on to receive two years of priestly formation at Saint Meinrad Seminary and School of Theology in St. Meinrad and four more at the Pontifical North American College and the Pontifical Gregorian University, both in Rome. In his first year in Rome, starting in the fall of 2012, Deacon Tucci had some struggles in his discernment, pondering the importance of the family to more than one vocation. “What kind of family could I have—in both the sense of having a wife or was God calling me to this family of a parish and the people of God?” Deacon Tucci recalled. In the spring of his first academic year in Rome, Deacon Tucci was a witness to history as Pope Benedict XVI announced his resignation and Pope Francis was elected. He and fellow seminarians from the North American College were at the front of St. Peter’s Square at the Vatican when Pope Francis came out on the balcony of St. Peter’s Basilica for the first time. “I can’t describe how much joy there was in the square,” Deacon Tucci said. “There we were—the leader of our Church has just been elected—and we were waiting to get to know him. 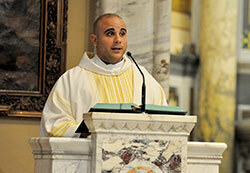 Deacon Tucci has also had the chance to know himself and his vocation better. Through his formation and opportunities for ministry both in Rome and in his visits back to the archdiocese, he embraced his call to the priesthood and realized it is at the heart of who he is, not simply the things he would be asked to do as a priest. He compares his excitement for the priestly life and ministry he’ll begin with his June 25 ordination to the reaction of St. Peter when he was in a boat on the Sea of Galilee, saw the risen Lord on the shore and jumped in the water to get to him as quickly as possible. Deacon Tucci will be with the people of Holy Family Parish in New Albany as he celebrates his Mass of Thanksgiving at 9:30 a.m. on June 26 at the parish’s church. On July 6, he will begin service as associate pastor of St. Christopher Parish and chaplain coordinator for Cardinal Ritter Jr./Sr. High School, both in Indianapolis. He believes that the priestly vocation he will live out then and into the future was made possible by God’s protection from the earliest moments of his life.